How Does Position Affect Geology? The goal of the study was to compare and contrast the geological features between Mercury and Pluto. These two bodies were chosen due to their extreme orbital radius differences in relation to the sun, with their overall size being quite similar. The data for this study was obtained by focusing on two particular satellite missions: MESSENGER, which explored Mercury, and New Horizon, which explored Pluto. Through this data the geological similarities and differences were compared. Mercury is approximately 100 times closer to the Sun than the dwarf planet Pluto. Pluto has an orbital radius of approximately 5,913,000, 000 kilometers from the sun while Mercury has a radius of 57,900,000 kilometers They are similar in regards to their size, with Mercury having a diameter of 4,878 km, Pluto’s being 2,274 km. Comparing this to the diameter of Earth, (12,756 km) shows these planets are quite small in comparison. Pluto and Mercury are similar in the sense they are both composed of hard materials. However, their geological characteristics are very different: Mercury has no atmosphere with extreme weather fluctuations, while Pluto maintains extremely cold temperatures and is covered by various elemental ices. Recent explorations, such as New Horizon’s 2015 fly-by of Pluto and the 2011-2015 MESSENGER exploration of Mercury have provided a plethora of new information of these formerly elusive entities, including a clearer picture of how their distance to the Sun affected their formation and geology. For the purposes of clarity, we will first discuss the individual characteristics of Mercury and Pluto, and then briefly compare the two, while considering how the extreme differences in distance from the Sun may have affected their current states. The temperature of Mercury demonstrates extreme fluctuations depending on where the planet is in its elliptical orbit. Mercury’s closest orbital radius is 47 million kilometers from the sun and 70 million kilometers from the sun at it’s farthest orbital radius. Due to Mercury’s proximity to the sun, it can reach temperatures as high as 430 degrees Celsius during the day. Due to the lack of an atmosphere, Mercury has difficulty retaining heat. This causes a large temperature fluctuation between night and day, with Mercury’s nighttime temperature reaching lows of -170 degrees Celsius. These extreme temperature fluctuations have caused the planet to be very dense, and its composition includes sulfur and iron in the core, while its crust and mantle are made primarily of silicate. 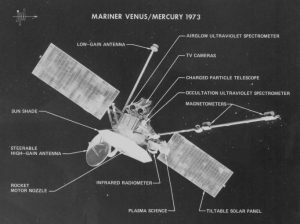 Much of what we know about Mercury comes from the Mariner 10 mission in 1973, where approximately 45 percent of Mercury’s surface was observed, and subsequent radar observations indicate that the planet may have water ice at both its north and south poles, made possible by deep craters that maintain frigid temperatures. The MESSENGER mission revealed that volcanic material and dried lava flows cover the majority of the planet’s surface, which is a strong indication of historic volcanic activity. This mission also showed the surface to contain enigmatic flat and shallow bright spots, which scientists suggest form when volatile material from the surface was eroded due to solar wind. Much of what we know about Pluto comes from NASA’s New Horizons mission, which was launched with the purpose of exploring Pluto and the Kuiper Belt. It was launched shortly after Pluto lost its classification as a planet, and was intended to explore both the newly designated dwarf planet and the other objects that lay more than a billion miles beyond Neptune’s orbit. The New Horizons team has been diligently publishing their findings in a variety of academic journals since July 2015, which has provided invaluable information regarding the dwarf planet’s geography and atmospheric components. Pluto has some very interesting geological features, ranging from its composition, to its mountainous landforms, and an interesting atmospheric makeup. Mountains can be seen rising 2-3 km above their surroundings, and are likely composed of water-ice bedrock. This can not be said with any certainty, however scientists have concluded this to be the most likely explanation, as there are limited materials that would allow mountains to form and maintain their shapes over millions of years in the temperatures that Pluto is subject to. 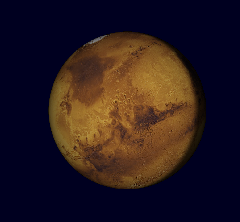 compositional variation throughout the planet, and evidence of a water-ice rich crust, a relatively young surface, wind streaks, and other curious characteristics. 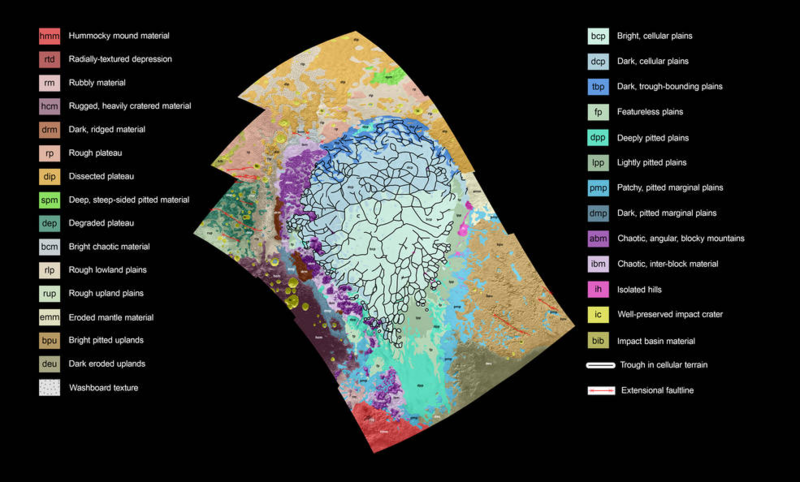 The New Horizon’s encounter was invaluable in collecting this data, and indicates that other small planets deep in the Kuiper Belt could have similarly complex geological histories, while the diversity of Pluto’s geology and long-term activity raises questions about how Pluto it has remained tectonically active so long after its formation. One theory about this tectonic activity is the partial freezing of a subsurface ocean may be driving recent extensional tectonic activity on Pluto (Hammond et al., 2016). 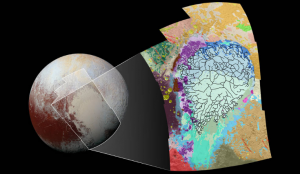 The lack of compressional features that would be caused by the ocean freezing, and subsequent volume contraction, suggest that the subsurface ocean on Pluto may still be present (Hammond et al., 2016). The atmosphere on Pluto is primarily composed of Nitrogen, however there are traces of methane and carbon dioxide, the amounts of which change daily. Scientists have also indicated that there may be an unidentified cooling agent in the atmosphere, which is affecting the lower-than-expected nitrogen opacity at high altitudes. The Plutonian atmosphere is a bluish haze, which is likely the result of very small particles with scattering properties. Finally, it is interesting to note that when Pluto is closest to the Sun in its orbit, its atmosphere forms a cloud around it. At its furthest point from the Sun, its atmospheric gases (nitrogen, carbon monoxide, and methane ices) create glaciers and snow. Mercury and Pluto are both part of our solar system and thus have many similarities. However, their positions in the solar system give rise to many differences as well. The areas in which these differences can be found are size/density, planetary temperature, atmosphere, and terrain. 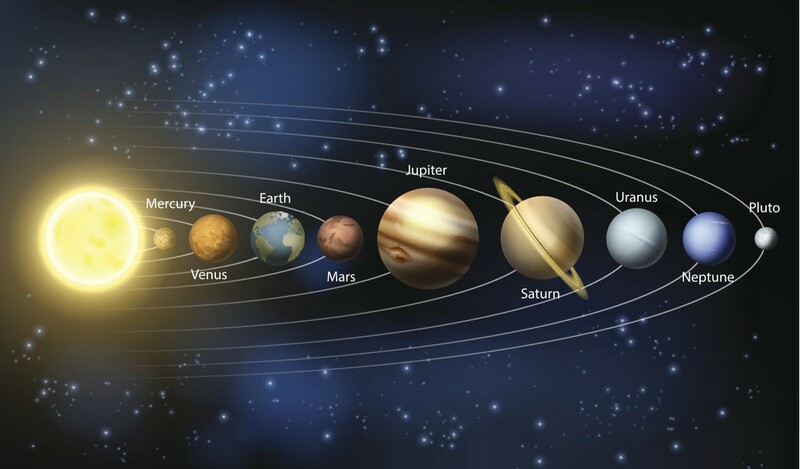 Mercury and Pluto share a commonality in that they are both very small in comparison to the other planets. However, Mercury is still twice the size of Pluto. The diameter of Mercury is 4,879.4 km, while Pluto’s diameter is only 2,360 km. For comparison, while Mercury is 38% of Earth’s diameter, Pluto is only 18% of the diameter of Earth. The density of Mercury is also much higher. Mercury is comprised of rock and metal with a density of 5.427 g/cm3, while Pluto is ice and rock with a density of around 2 g/cm3. Mercury is comprised of rock and metal with a density of 5.427 g/cm3, while Pluto is ice and rock with a density of about 2 g/cm3. Because Pluto is smaller and less dense than Mercury, it has a much lower force of gravity. While you would feel 38% the force of Earth gravity standing on the surface of Mercury, you would experience only 5.9% of Earth gravity on Pluto. While the surface of Mercury is dominated with impact craters, Pluto’s surface demonstrates both cratered and smooth regions. Basaltic rock is present on the surface of Mercury due to widespread volcanism. Mercury has very dense core implying solid core being iron rich. Just like Earth we have noticed that mercury’s true magnetic poles shift over time (dynamo effect). Similar to Earth, Mercury is thought to have an exterior crust 100-200m thick, a mantle 600 km thick, and an inner core 1,800 km radius. In contrast to Mercury’s lack of atmosphere, Pluto has a thin atmosphere consisting of nitrogen (N2), methane (CH4), and carbon monoxide (CO), which are in equilibrium with their ices on Pluto’s surface. However, the planet is so cold that during part of its orbit, the atmosphere congeals and falls to the surface. The average surface temperature is 44 K (-229 °C), ranging from 33 K (-240 °C) at aphelion to 55 K (-218 °C) at perihelion. Pluto has a moderately eccentric and inclined orbit, which ranges from 29.657 AU (4.4 billion km) at perihelion to 48.871 AU (7.3 billion km) at aphelion. Pluto has an orbital period of 247.68 Earth years, meaning it takes almost 250 years to complete a single orbit of the Sun. Meanwhile, its rotation period (a single day) is equal to 6.39 Earth days. Like Uranus, Pluto rotates on its side, with an axial tilt of 120° relative to its orbital plane, which results in extreme seasonal variations. At its solstices, one-fourth of its surface is in continuous daylight, whereas another fourth is in continuous darkness. When it comes to temperature, Mercury and Pluto are very different but also share frigidly cold nighttime temperatures. Temperatures on Mercury’s surface can reach 800 degrees Fahrenheit (430 degrees Celsius). Because the planet has no atmosphere to retain that heat, nighttime temperatures on the surface can drop to -280 degrees Fahrenheit (-170 degrees Celsius). This nighttime temperature is only roughly 100 degrees Fahrenheit warmer than Pluto! Pluto is very cold! The temperature on Pluto ranges from -387 to -369 Fahrenheit (-233 to -223 Celsius). How did the distance from the Sun affect the geology of Mercury and Pluto? It is well established at this point that the greater the distance of an object from the Sun, the slower its orbit. In addition, the idea well established that the planetary distance from the Sun directly influenced composition—the Terrestrial planets that are close to the Sun had much of their gasses evaporated by the Sun’s heat, leaving the particles to bind tightly together as rock and metal, while planets further away were able to retain their gaseous nature as the heat was less intense. Pluto appears to fit outside of this hypothesis, as it is primarily ice and rock, until a few things are considered. First, the distance from the Sun and the temperatures on Pluto are so low, that most of its gasses (atmospheric and otherwise) tend to freeze, creating glaciers and ice mountains. 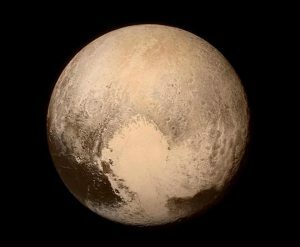 Second, the running theory about Pluto’s formation is very different than those of the other planets. Instead of a bunch of tiny particles coming together, with the gravity and orbit lining up just right, to form a massive ball of particles, Pluto is thought to be the result of two big blocks of ice colliding. The distance from the Sun is conducive to its primary composition of various ices, and one can speculate that its slow orbital speed is directly connected to the presence of different glaciers and the composition of its atmosphere. Mercury and Pluto are the “bookends” of the solar system. Because of this, they provide a good opportunity to understand how celestial position in the solar system can affect geological makeup. 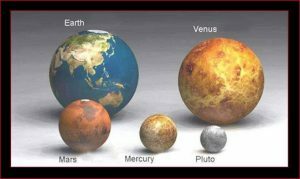 They share similarities in that they are the two smallest planets (or dwarf planet, in Pluto’s case), and share extremely cold night temperatures, despite Mercury’s proximity to the Sun, as well as both being very dense. Due to how close it is to the Sun, Mercury has no atmosphere, while Pluto’s atmosphere forms a cloud around the dwarf planet when it is closer to the Sun, and the atmospheric gasses freeze to form glaciers and mountains when it is at its furthest. Based on these observations, the distance from the Sun is not the only factor determining the geological composition and makeup of these celestial bodies, although there is a significant effect. The comparison is not exact, partly due to incomplete knowledge and preliminary information, and partly because Mercury and Pluto have very different compositional origins and current classifications. Black and white observations on this subject are not particularly useful, because there are so many factors that go into the geological and compositional aspects of a planet—for example, like Mercury, Pluto also does not have an atmosphere and is known for its extreme temperature fluctuations, despite being further from the Sun than Mercury, and the planets in between them having different features altogether. However, it is useful to use distance as an indicator for certain geological factors. Enchanted Learning, WWW Document, http://www.enchantedlearning.com/subjects/astronomy/planets/. N.M. Short, Planetary Geology, pp 287-289. Kepler’s Third Law supports this. Stern, S.A., Weaver, H.A., et al. “A giant impact origin for Pluto’s small moons and satellite multiplicity in the Kuiper belt.” Nature. Vol 439. 2006.